Do you love waltzes? If you do you’ll love this Stephen Sondheim score. I’m not an expert in music, but I read that all this show’s songs were written as waltzes and the result is one of the most melodious scores that have ever been written for a musical. Sondheim’s most famous song, “Send in the Clowns”, belongs to this musical, but my favorite is the haunting “Every Day a Little Death”. I also have to mention the superb “A Weekend in the Country”, a flawless example of Sondheim’s genius. For me this Royal National Theatre cast recording is the best of all this show’s recordings. There’s something dramatic and artificial about it that makes it perfect and the cast is truly remarkable. 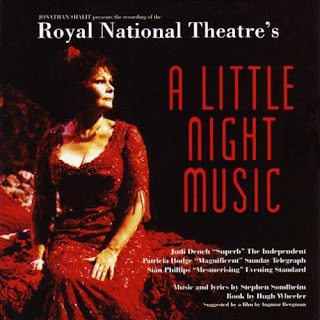 Judi Dench is brilliant as Desiree and her “Send in the Clowns” is the most touching rendition of that song that I ever heard. Joanna Riding is the best Anne ever, Patricia Hodge is a very human Charlotte, Siân Phillips is a perfectly decadent Madame Armfeldt and Claire Cox is a lovely Fredrika. Laurence Guittard as Fredrik and Lambert Wilson as Carl-Magnus are both strong. One last word for the excellent Issy Van Randwyck, who delivers a winning “The Miller’s Son”. This is Sondheim at his best and this is probably the most haunting of all Musical scores. In a word, this cast recording is perfection!